• Built & rearranged so much furniture around the house! In addition to finally finishing the WALL OF MALMS in my bedroom, I moved the bookcases from my office to Sym’s bedroom, moved a little side table from my bedroom to my office (where it now holds the printer, much to Gwen’s delight), taken one of the dog crates in the foyer down and made room for a sorely-needed shoe rack, and put doors on the dvd cabinets to keep little baby hands out. I also jettisoned a ton of old/broken/unwanted stuff, like Sym’s old desk and the remains of one of my old dressers-although I kept parts of the dresser to construct a headboard from, which I hope to get started this weekend. • Created some new products for my shop: iron-on patches! I used the designs from my jewel & gem stickers, and after testing the security of the iron-on adhesive and the colourfastness of the patches themselves by ironing a whole whack onto my old summer bag I’m happy to say that they are now available in the shop for only $2 a pair (plus shipping). You can check them out here. • Started a penpal club! I was thinking the other day about how much I like getting stuff in the mail and participating in swaps and I thought… what if the swap went on forever? Originally I just wanted a couple penpals for myself but I had such an overwhelming response that I decided to match people with penpals of their very own. I’ve been collecting everyone’s info and entering it into a spreadsheet, and hope to match everyone with their partners this weekend. I’ve also been gathering up some cute little trinkets to send to my own penpals (of which there are six, oops). I think I’ve posted these clematis (clematises? clematisi?) every week but they are truly amazing this year! my new craft closet, so organized! This short week really messed up my schedule. I had a bunch of etsy orders to make & ship and I thought I had much more time than I actually did. I kept doing stupid things like deciding to rearrange the closets and furniture and obsessively playing Monument Valley instead of making them! In the end I got everything out on time AND created a craft closet for myself that keeps all my supplies safe from baby hands. Gwen has been quite the little terror this week: pulling the couch apart, unzipping all the cushions, refusing to eat pretty much everything that isn’t breakfast. She’s cutting her thirteenth tooth this week, so that explains why, but I also think she’s getting out all the destruction she reigned in while we were out of town. Now I’m off to spend the rest of the weekend building the rest of the new dressers (that we bought EASTER WEEKEND, lol I can’t believe I haven’t finished them yet! ), moving some bookcases into Sym’s room & working on a fun new project for my etsy: iron-on patches! I posted a lil sneak peak on instagram last night, I just need to test the patches for colourfastness and how well they actually iron on before I start listing them. This past (long) weekend we went to visit Taylor’s family in Kelowna. It was Gwen’s longest car ride so far, remember we didn’t even get a carseat until late last August when she was almost 10 months old. The only places she’s been in a car here are the grocery store and Ikea, not exactly long-haul journeys. I had the brilliant idea of leaving Friday night, at Gwen’s bedtime, instead of Saturday morning. That way we’d miss both the after work rush hour traffic, plus the holiday weekend traffic, and hopefully Gwen would sleep the whole way there. That last part didn’t exactly pan out- she slept partway but woke up when we stopped because someone had to pee (it was me). She dozed on and off the rest of the way and eventually I had to sit in the back of the car and let her pinch my nose because that’s the only thing that would make her happy. The drive up to Kelowna is about 4-ish hours and can be incredibly tedious, but it’s even more so at night as there isn’t even any scenery to look at. For the last hour I was so tired and bored I wanted to drop dead, but I still think it was a good idea. If we’d driven up on Saturday we wouldn’t have arrived until the afternoon and Gwen would have been much grumpier. As it was we arrived after midnight and after a diaper change & a bottle Gwen went straight to sleep and woke up in fine spirits the next morning. We had a very nice time up there; and Gwen actually behaved MUCH better than I thought she would. At home she’s a tiny whirlwind of destruction, but I guess because she was in an unfamiliar environment she was disinclined to tear stuff up. She enjoyed playing in the backyard and getting spoiled with snacks. On Saturday morning we went with Taylor’s sister Jaime and her family to Kangaroo Creek, which is like a petting zoo of wallabies and lil kangaroos. We saw a tiny joey still in her mama’s pouch and were able to hold some older babies. They were so cute! There were also some sassy goats, fat pigs, some baby capybaras, a grumpy adult capybara and assorted birds (including an emu that was just pooping everywhere). On Sunday Taylor’s sister & her family came over to their moms’ house for a barbecue and so the babies could play together (although Gwen is actually quite aloof and mostly just wanted me to hold her). Taylor is holding Steve and I have Django. Steve was very sleepy but Django was super friendly! He licked everyone like a puppy and tried to nibble Gwen’s jacket. Since Taylor had to work on Monday night we left early that morning to drive back. It was a much less boring drive during the day and Gwen was a total trooper, barely fussing at all even though she was trapped in the hated carseat for so long. Georgie was a total headcase though, both ways. I realized she hadn’t been in a car since I think 2011? and she did not like it. She was shaking and panting like crazy and I had to hold her pretty much the whole way. It was a good weekend but also really exhausting, I wish I could have another three days to recover! Last week Taylor bought himself some new clothing, including a gross shirt that looked like the uniform of the workers for some dystopic future totalitarian regime. After some gentle encouragement from me (“I JUST DON’T LIKE IT! TAKE IT BACK!”), he exchanged it for these AWESOME space shoes for Gwen. 1. With the shoe facing you, thread the elastic through the bottom righthand eyelet, leaving only a short length (approximate 3/4″) within the shoe. 2. Line up this short length with the elastic on the outside of the shoe. 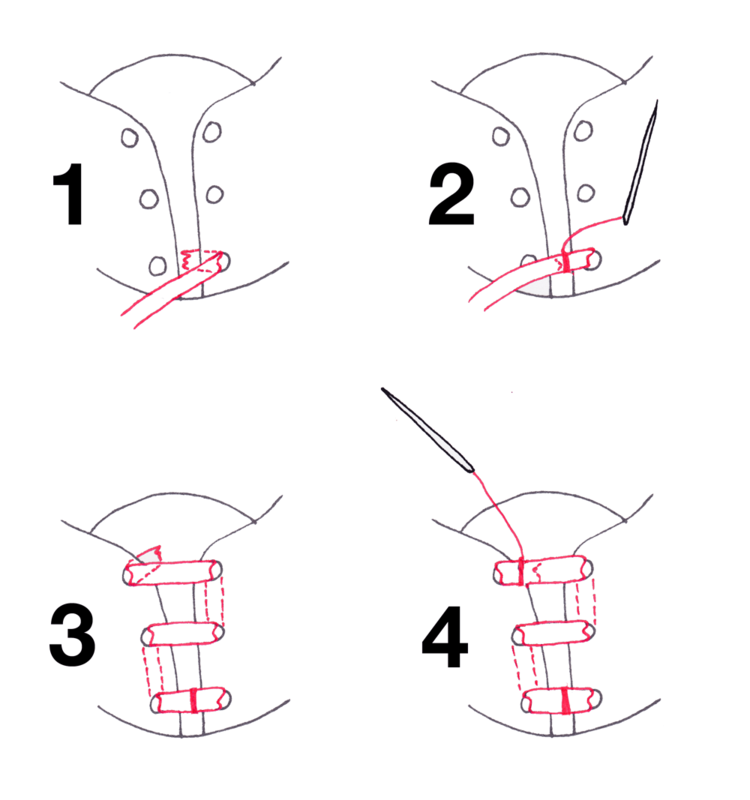 Sew vertically through both layers of elastic. You’ll probably want to go over the seam a couple times to make sure it is secure. Knot the thread & trim excess thread and elastic. For shoes with more eyelets simply continue the alternating horizontal/vertical lacing until you reach the top of the shoe. You want the horizontal lacings to be on the outside and the vertical laces to be on the inside. Pull the elastic through the eyelets tight enough that it lays flat and holds the two sides of the shoe in place, but not so tight that it is stretched out and causes the two sides to pull together or overlap. 4. When you reach the top of the shoe, line up the two thicknesses of elastic (on the inside & outside of the shoe, as in step two) and sew vertically up & down through both layers of elastic. Knot the thread & trim excess thread and elastic. Repeat steps 1-4 for the second shoe. Gwen wore these out for walks & to play on Sunday and they were a huge success- easy to get on and off, but stayed on her feet while we were out and she had zero interest in playing with the elastic. When they had the laces she just sat and pulled at them, so this made a big difference. You can try out different lacing techniques with the elastic to get different looks; I like this simple, clean style with the colourful galaxy-print shoes. This technique is also suitable for shoes with both even and odd numbers of eyelets. I used black elastic since the shoes came with black laces but you could use any colour to match, contrast or compliment your little one’s shoes. Sym said my vintage typewriter made me a creep like Ezra on Pretty Little Liars so I typed up some notes & slid them under her door. she was not impressed. How was your Mother’s Day? Mine was great JUST GREAT let me tell you. Gwen spiked a fever on Friday night and was sick all weekend with snot and sneezes. I’m sure Taylor would have let me sleep in on Sunday but Ms Babyface had other ideas, and getting all the crusted boogers off her face/out of her hair, taking her temperature and giving her Advil are so much easier as two-person operations. Happily it seemed to be a short-lived sickness and by Sunday evening the fever & sneezes were gone, and now only the boogers remain. This is especially good for Taylor since he is sick now as well. 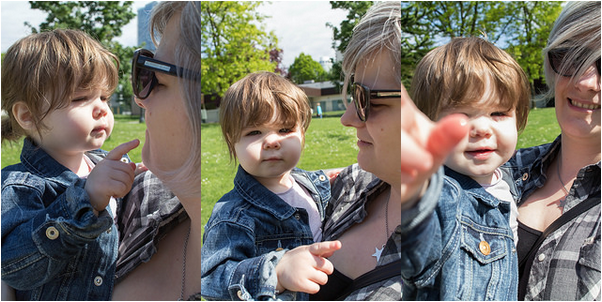 In spite of the gross, cranky baby I had a pretty good weekend. Sym got me flowers and made me a card, actually two cards as Taylor hired her to make one from him & Gwen as well. On Sunday morning Taylor made brunch for everyone: scrambled eggs with cheese, bacon, strawberry pancakes and crescent rolls. Afterwards we took Gwen for a walk and in the afternoon I forced Taylor and Sym to help me move some furniture around the house. I still haven’t finished building the new dressers we bought Easter weekend, how sad is that? I hate confrontation. Haaaaaaate it. When I get into facebook or twitter arguments (actually have I ever been in a twitter fight? I don’t think so. My twitter is public; my facebook is locked, maybe that’s why, haha) I get super stressed out and dread logging back in. Usually I end up just blocking people who anger me, block everyone, that’s my motto. If I disagree with a blog post I usually just quit reading rather than comment with a dissenting opinion because my actual opinion is “What is the point? They aren’t going to change their mind, and they’ll probably edit the post so I look like a lunatic” (re: the pregnancy arms debacle). I think part of the reason I hate confrontation is that I’m not great at express thoughts with word forms (ha ha). In person during a confrontation I get so frustrated and angry that I start crying, which doesn’t help my cause. On the internet I find myself coming across as inarticulate and foolish and I usually just end up capslock yelling a sarcastic joke about the topic, like the time I posted the George W. Bush “Mission Accomplished!” picture with a link to an article about how the anti-vax movement was found to be the cause of the infant whooping cough deaths in California last year. I was like “GOOD JOB, ANTI-VAXXERS, YOU DID IT, YOU KILLED THOSE BABIES.” Truly, one of my finer moments. I even get anxious about confrontational things when I don’t really think anyone who is invested in it will even see it. Yesterday I pent my entire break (ie naptime) drafting a blog post about my thoughts on the blatant & disgusting commercialization attempts by some online retailers in the #redballoonsforryan hashtag (for the record, I’m against using the tragic death of a child to drive traffic and sales BUT HEY THAT’S JUST ME) and literally one second after I hit publish I panicked and deleted it, just in case someone who I was calling out somehow managed to find this nobody blog and yell at me. I have some theories why & because of who (whom?) I’m like this but I don’t want to get into it in case those people yell at me too, haha. But IRONICALLY I wrote this while simultaneously arguing on facebook about something idiotic and I haven’t blocked anyone yet so maybe the tide is turning? WHAT. WHAT. WHAT DOES ANY OF THAT EVEN MEAN???????? We refunded you for $73.10 and $23.00 was that not for your total????? THIS MAKES NO SENSE, except their product listings also have garbled language, misused words and other errors so I guess it does. And for the record you CAN see your cancelled transactions on etsy- if you are the seller they are on your sold orders page, under the (plot twist!) “Cancelled” tab. Cancelled orders aren’t searchable though, and they probably have a ton since they seem to cancel orders at the drop of a hat (if you look at their reviews, any that aren’t accompanied by a product photo have been cancelled). Anyway, I responded to this nonsense message with my secret weapon: SCREENCAPS. Screencaps of their refund offer, screencaps of the partial refund I received on the 16th of April, screencaps of my original order and screencaps of my original payment. Unsurprisingly I received no response until last night when the $51 appeared in my paypal with no message. I’m still blocked from their instagram (I wonder how many dissatisfied customers are) but it seems they’ve moved off of etsy to their own site, which means no more bad etsy reviews & even less accountability. Hopefully they’ve taken my SUPER AMAZING advice to heart and will no longer be wasting people’s time with shirts that never ship, but most of their items still say they take up to 4 weeks (or 4-6 weeks) to ship so probably not. I just hope that maybe by sharing the story of how I dealt with them I might be able to help other people who’ve been scammed by these ripoff artists who care more about being popular with cool bloggers than with providing adequate customer service. My old cat Ophelia passed away yesterday. She was 16 years old and her mental health had been in decline for a few months. Yesterday her owner, Colter, was taking her to the vet and she died on the way there. In mid-March I went to visit Ophie at Colter’s place, as he was worried she wouldn’t be around much longer, so I was able to say goodbye. I adopted Ophelia from the SPCA in Coquitlam in August of 1998. 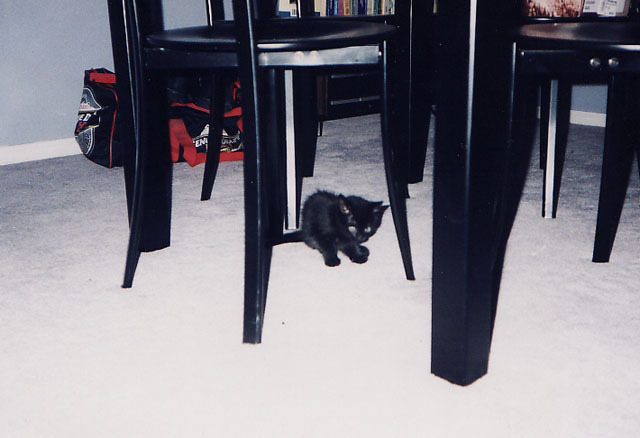 My then-boyfriend and I went together to pick out a kitten, and after looking at them all we were stuck trying to decide between a silver-tabby Persian and this tiny little speck of black fur. I put my hand in the black kitten’s cage and she curled up against it, started purring and almost immediately fell asleep and my decision was made. This little black cat was mine. Ophie lived with me mostly until 2006. I had to rehome her temporarily a few times but she always came back to me, which unfortunately wasn’t the best for her. She didn’t like being around kids or dogs or other cats so she spent all her time alone, hiding in Sym’s room. She was a very sweet and affectionate cat who loved being around people so I could tell she wasn’t happy. I also didn’t think boomeranging her from me to other people back to me was good, so I didn’t want to try and find her another home, but serendipitously, a new home found us. A few years ago Ophie went to live with my hairstylist’s roommate Colter. He missed his old cat and wanted another, but not a kitten, an adult cat. As soon as I met him I knew he was the best owner for her, and I was right. With Colter Ophie thrived, she was so happy and that made me happy since I had been feeling guilty about rehoming her so many times. I’m so grateful that he was able to provide a wonderful, loving home for her to live out the last years of her life. These pictures are from the summer of 2011, Colter was in the hospital so Ophie stayed with us for a couple of months. I remember the day Colter was discharged he called and asked me to meet him behind the hospital (it’s near my house) so he could take Ophie home with him straight away because he’d missed her.